THE impact of TC Heartland (2017, SCOTUS) has been spectacular. So far we’ve been hearing about a 60% decline in patent litigation in the Eastern District of Texas. That’s just the beginning! The patent trolls’ lobby is understandably unhappy. Earlier today David Newman (Chair of Gould & Ratner’s Intellectual Property Group) wrote in Watchtroll that “TC Heartland decision follows the trend of eroding patent holder rights,” but actually what he meant to say was that SCOTUS fixes patent practice, bringing it into closer alignment with what the patent system was supposed to be all along (before it got profoundly debased). TC Heartland is here to stay and people like Newman might not. Jobs like his are becoming obsolete and he too might soon become redundant. 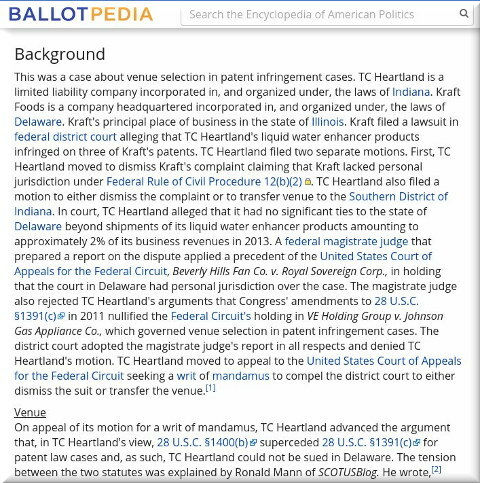 If you’re a patent troll, then sure, TC Heartland is terrible news. It might be too early to say just to what degree the SCOTUS decision will enable venue challenges. The decision is less than half a year old and it also took Alice years to ‘mature’ — to the point where the USPTO might soon abolish software patents altogether. “It might be too early to say just to what degree the SCOTUS decision will enable venue challenges.”I’m not a law professor, but I know enough about TC Heartland to say that its main/net impact will be the ability to relocate away from the likes of Gilstrap. Unless a company trades primarily in the Eastern District of Texas, it will be incredibly difficult to drag it down there (also unless the defendant is unaware of the consequences of letting it be). We have already seen how Gilstrap got ‘slapped down’ by higher courts, for refusing to let cases depart from the Eastern District of Texas (in defiance of SCOTUS). “The bottom line is, there’s a strong push for patent trolls’ ‘rights’, for the ‘right’ to patent abstract ideas, and for biased judges to rule on these matters in order to maximise profits around their court venue.”Patently-O is still a relatively good source (less radical than most) for some insights and days ago it published this figure about “patent size”. It was an automated analysis of patents’ scale, plotted based on pretty big data sets. For some patents, the composition can be just as shallow as putting together numbers and citations (from reusable templates), resulting in longer patent texts even when the substance is low and quality/merit is questionable.